Recently I got the chance to meet Bjorn Kuipers in person. 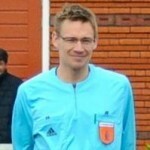 It was a great chance to do an interview with this Dutch top referee, but I also thought about asking something extra. 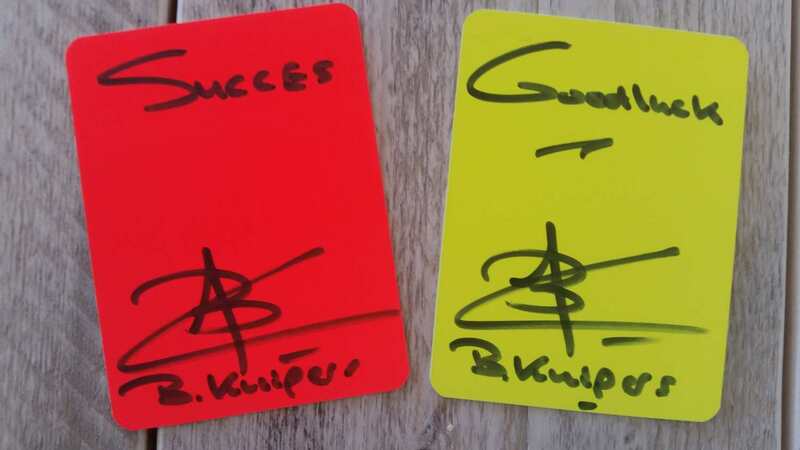 I brought some red and yellow cards with me and he wrote an autograph on it … and you can win a set of signed cards by Bjorn Kuipers. How to win those cards? The goal of my referee blog is sharing tips, interviews and other stories that make you a better referee. And I can use help with that from every referee in the world. Sharing knowledge is also the idea behind this contest to win the signed cards by Bjorn Kuipers. You need to share the best tip you ever got as a referee and describe shortly how this has helped you and thus might be useful for others. By sharing your tip you give me permission to use it in a future blog post and I’ll of course mention you as the source. To take part in the competition, fill out the form below. I ask for your name so I can mention in future blog posts who shared the tip. If you want to share where you’re from, just put it there. I’d love you to get my weekly newsletter, but that happens only if you really want to receive it. If yes, tick the box at the last question. So you will NOT automatically get the weekly newsletter. You will get one e-mail shortly after submitting your tips as confirmation. A winner will be randomly selected under participants that submit a useful tip for other referees. The winner will announced on Dutch Referee Blog and also will be contacted via submitted e-mail address. The winner needs to reply within two weeks notice after the announcement to give his postal address, otherwise another winner will be selected.